It’s a thoughtful Tuesday and today I share a little quote with you. Most of us are fond of imagining greatness and would not actually put things in place to let what our minds see be visible for everyone to see as results. It’s a great thing to dream big and imagine, after all it’s your wildest imaginations God will exceed so why imagine or dream small? Go on and dream big but at a point you’ve got to wake up for your dreams to come true. Put your thoughts together and work hard at achieving those dreams, with God on your side, you will jump over hurdles to the finish line successfully. 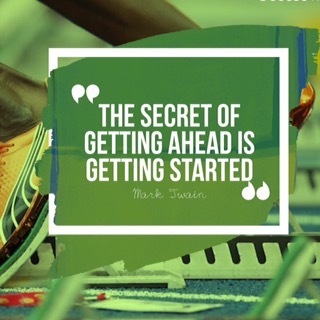 So start something now! That thing you’ve been planning on for decades, it’s time to move it from your mind to paper then from paper to reality. Always remember that many are the plans of man but it is God’s that will prevail, so don’t leave God out of the equation, without Him it can never be balanced. ← Today’s fragrance:Be at peace will all. I will start tomorrow! Just kidding…great post! Appreciate you and your inspiration!